Microsoft Office is very popular and widely used productive suite. It consists of number of useful applications like Word, Spreadsheet, Presentations and lots more. It is a premium Microsoft products and comes with a price tag. Incase you are looking for free alternative to perform tasks as done in MS Office, checkout following listing of free online and offline MS Office Word alternatives. It is a full Office suite very similar to MS Office. It is ideal for word processing, spreadsheets, presentations, graphics, databases creation and management. Using OpenOffice, you can open, create and edit Office files compatibility with different applications including Microsoft Office. It is also available in portable version. It is a handy and free alternative to Microsoft Office Word. It is very similar to MS Office in terms of looks and functionality. It supports all major document formats like Microsoft Word, Word Perfect, Open Document (OpenOffice.org), Office Open XML (MS Word 2007), RTF, HTML. AbhiWord processor is also available in portable format that does not require install. It is a small yet powerful free word processor software based on the Microsoft WordPad word processing engine built into Windows. Jarte has all basic features of standard WordPad and Word software in neat portable format. It is a free productivity software from IBM that includes a word processor, spreadsheet program and presentation software. It supports open document format (.ODF extension), Microsoft Office and Lotus SmartSuite files. IBM Lotus Symphony contains all basic and advanced features of a Word software. NeoOffice is a free MS Office alternative for MAC OSX users. It includes different set of applications like: word processing, spreadsheet, and presentation programs. NeoOffice Suite is available in number of languages and is ideal for MAC OSX users looking for free Word processor. If you are only looking for simple and free Word processor alternative as against complete suite, then checkout Bean. It supports all the basic features of a Word processor producing proper formatted output. Bean processor also support common word documents file formats. We have seen free alternatives for Windows and Mac users above. 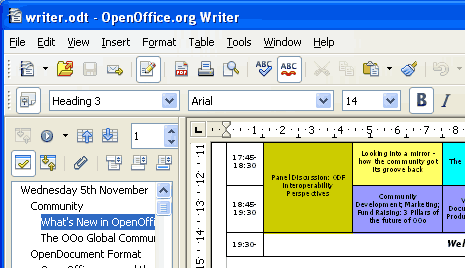 KOffice is a free Microsoft Office alternative for Linux users. KOffice Suite consists of various applications like KWord, KSpread and KPresenter to make documents, spreadsheets and presentations respectively. Google Docs is a best online alternative for Microsoft Office. Just use your Gmail or Google account to login into Google Docs and create any kind of Office document. You can store documents online, publish, share, embed or even download them in any desired format. Google Docs is very flexible and easy to use! Just like Google Docs, Zoho is another online full featured Office suite. It has over 20 different application for your Word processing needs. Interface is quite simple and easy to understand. Zoho online [http://www.zoho.com/] suite is compatible with almost every popular document format. Tryout! ThinkFree online tools are good enough for basic document opening, conversion and editing. It has good feature list but is little slow as compared to Google Docs and Zoho. Checkout ThinkFree if previously discussed online options did not work for you. It is little different looking online Word processing tool. It has glitzy interface with floating windows. You can create documents, spreadsheets online not for familiar looking interface. Try Peepel if you want have little fun while tying boring documents. GOffice is a quick and easy to use simple online Word processor. Start screen loads Word processing editor. You can quickly type and format the text. After editing, save the documents as PDF, Word or as an image file without having to install anything at gOffice. Above were few Free Microsoft Office Word alternative. Which is your favorite alternative or do you still prefer to use Microsoft Office? KOffice does not have an exicutable file, so how do I download and install it from one of the site? There is no information on their website. @Sharon – If you want to install koffice for windows then go to windows.kde.org and click the download link for koffice( windows) . Hope it will help you. Google docs is my favorite. I devised Pros and Cons of some of these alternatives at Microsoft Office Alternatives That Work!. Hope that helps in choosing your best alternative.